Possibly you think I've gone to the great beyond or at least that I'm on vacation. In truth, I'm just finding my way back to the real world after the encaustic conference and the huge amount of creative input that stirred my recalcitrant brain. And I've been tired. Maybe all that thinkin' taxed my limited energy. This week I've been in the studio working. 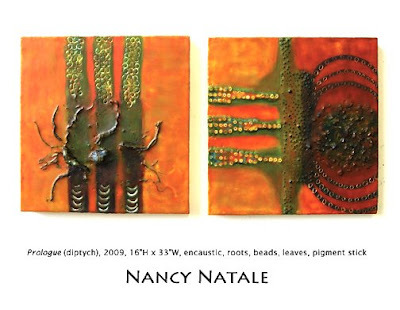 As I mentioned before I went to the conference, my intention is to make some new work that combines encaustic with a kind of tribal, fetishistic work that I made in the 1990s. It's coming along pretty well. I won't show any of it yet because I'm only on my second piece and want to see how things develop as the series goes along. These are two Tatanua masks from New Ireland, near New Guinea in the South Pacific. 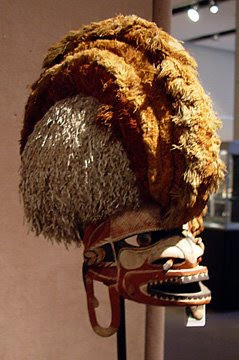 I had never seen masks like this before and really love them - not for the faces, but for the fabulous headdresses. 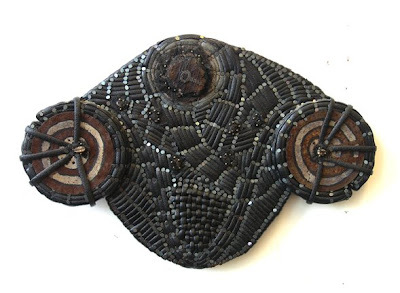 These masks are made for dancing and worn mostly by men. 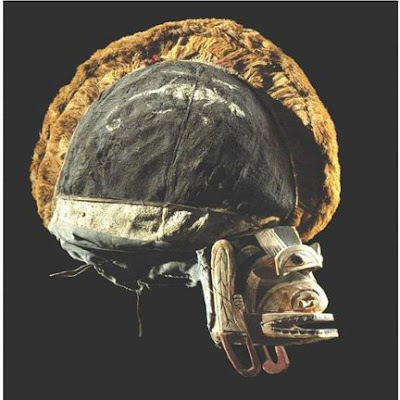 A crest divides the headdress in two and each side is different so that when a line of dancers turns, they display an entirely different look. I find the idea of that striking. The work I'm making does not look like this, but these masks inspired me to the possibilities and potentialities of various materials. 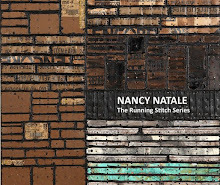 I've also realized recently how linked my work is to textiles and how inspired I am by them. 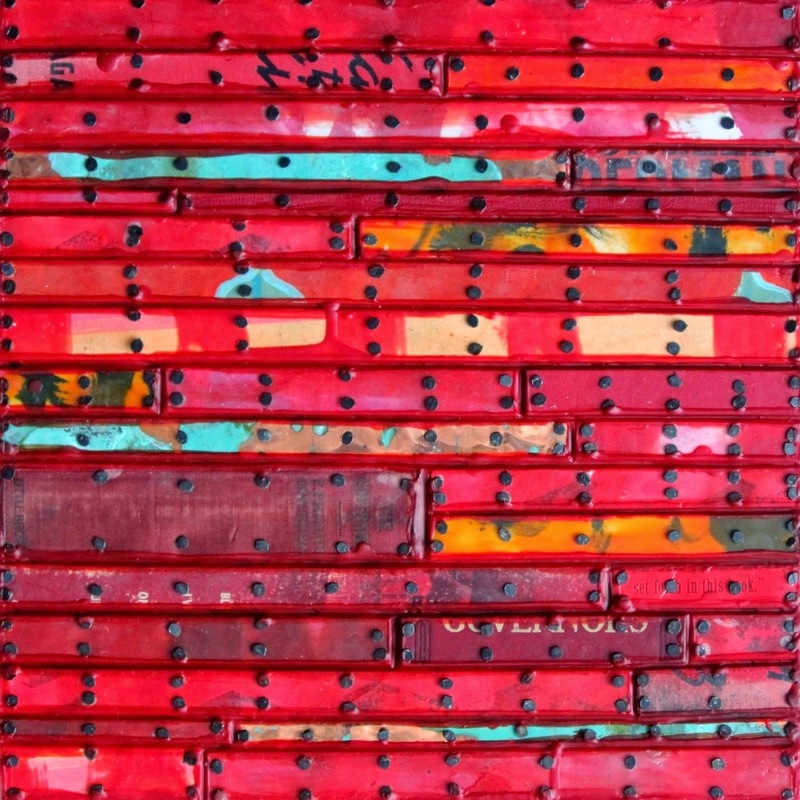 I knew already that I loved the work of the fabulous el Anatsui, and I found one of his works online that was new to me and that looked less metallic. So there you have it, a distracted blog entry. I'm going to put us all out of our misery and go watch the second playing of Rachel Maddow to see what she has to say about all those tomcat Republicans that just got knocked off the presidential shortlist for 2012. I guess Sarah Palin will outlast them all. Friendship is the greatest part of the encaustic conference for me. 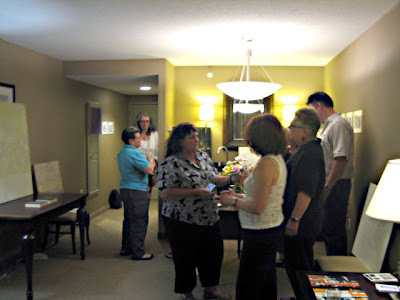 I love seeing and chatting with people - sometimes just for seconds to say hello and at others for extended hangout sessions during dinner or other opportunities to get together. This year was particularly rich for me in time spent getting to know people a bit through their work and their life concerns. Two new friends, Debra Ramsay and Cora Jane Glasser, staged a surprising stealth show called Material Matters in their hotel suite, sort of a mini art fair. This was a major success where they each showed a significant body of work (which looked great on its own and in combination) and where they received visitors Saturday, Sunday and Monday evening during the conference and post conference. These very successful evening sessions turned intothe 311 Salon where visitors looked, nibbled, chatted, laughed and even engaged in serious discussions. 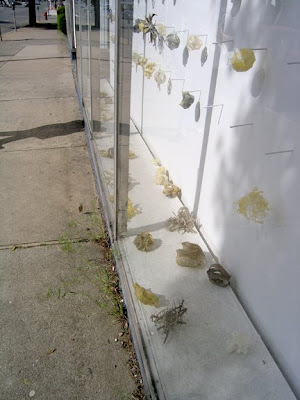 Lisa Pressman has posted on her blog a series of comments about titling paintings from several of us involved in the discussion at the salon and subsequently online. One night at 311 Salon hosted by Debra and Cora with l to r: Eileen Goldenberg, Kimberly Kent, Linda Womack, Cora Glasser, moi, Bill Womack. I think there's someone else in there, but I can't see/don't remember who. Linda Womack took a little video at the salon and posted it on her blog. She is a very conscientious blogger, unlike some of us, and has included photos from many of the shows and workshops at the conference. 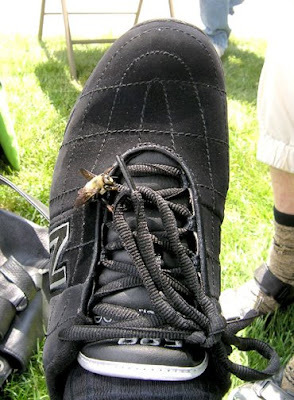 I, on the other hand, was busy viewing and photographing a giant bee that landed on my shoe and that someone thought was an ornament. We all have our priorities! Jiggity jog, etc. Just got home tonight. 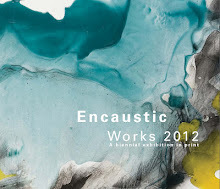 Well, it was a fabulous encaustic conference. I am exhausted but energized by thoughts of new work to come. The Friday, Saturday, Sunday conference was excellent, but the two post-conference critical sessions that I took yesterday and today were exceptional opportunities to have people (Barbara O'Brien on Monday and Miles Conrad on Tuesday) with experience, training and true gifts for analysis and encouragement look at my work. Barbara and Miles gave me (and others in the classes) feedback and suggestions for ways to move my work forward, improve my statement and other presentation documents, and to think about my work in a larger context. It was really inspiring and stimulating. I know much will come from it. So you may be wondering what the hell happened to my blogging from the conference. The answer is that apparently high-speed internet has not reached the North Shore of Massachusetts (Beverly, Danvers, etc.). The wireless connections were: (a) non existent or (b) slow enough to have drying paint beat them. This was a frustrating condition that bothered me when I tried to blog early in the morning of day 2 and again the next morning, but then I gave up and just went with the flow of enjoying myself and too bad about the rest of you. I even stopped taking photos. I only have them from day one and they're in the laptop. So I'll post some later although they're old news by now. I only had a couple of photos in my camera and here they are - Miles Conrad's installation Wax and Wane composed of wax pieces made in a workshop at last year's conference. 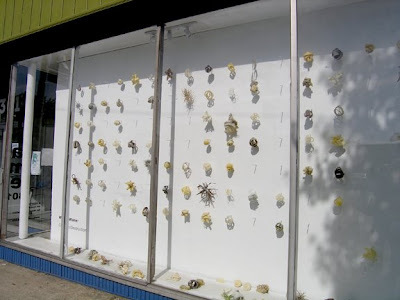 They were installed in the window of Gallery 301 to see what happened as the wax melted and the pieces disintegrated in the sun. You can see that a lot of pieces fell off and landed on the bottom of the window. These photos were taken on Monday when the sun was really beating down, but now a week of cool weather and rain are in progress and making the pieces stay on their perches. It will be interesting to see what happens during the month of the installation because it's so weather dependent and the weather in Beverly in June is anybody's guess. More later and meanwhile read the blogs on the conference blog for updates. I did see that Linda Womack had two really full accounts of two days up. Now off to my own bed after an exhausting five dayzzzzzzzzzzzzzzzzzzzzzzzzzzzzzzzzzzzzzzz. The blog thing is OK but I guess I don't have the commitment to posting down. When I'm not in the studio, I'm not out looking either. Call me lax or whatever, but that's how it is. 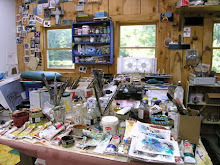 But this week the Encaustic Conference at Montserrat in Beverly, Mass. has finally arrived and I'm very excited to get together for the third year with encaustic aficionados and bask in the warm, waxy ambiance. It's always so inspiring and such fun to hang out for a few days to talk art and life. Here is this year's postcard that I will give out to show my work. This year I'm presenting a talk/demo about editing digital photos of artwork using Photoshop Elements. I know there are many technophobes who are daunted (and rightly) by all the possibilities that Photoshop offers and don't know how to find the info they need to do the job for them. That's why I'm sticking to Photoshop Jr. and restricting my talk just to editing photos of artwork, broken down into five basic steps. I'm also including some background on how digital photography works. I'll be showing some PowerPoint slides and live PS Elements. The conference is just Friday, Saturday and Sunday, but I'm staying on Monday and Tuesday for two day-long critical feedback workshops that are limited to 10 participants each. Monday will be with Barbara O'Brien, the conference's keynote speaker and long-time curator and art critic. 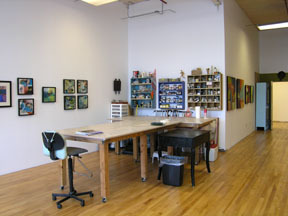 Tuesday will be with Miles Conrad of the Conrad Wilde Gallery. I really want the opportunity to think about and discuss my work in a critique format so I'm taking a double dose. I've been doing a lot of thinking about my work since I've been feeling kind of stymied by where it's going (or not going). Last week I finally got a book on Lee Bontecou's work that I've been wanting for a long time. 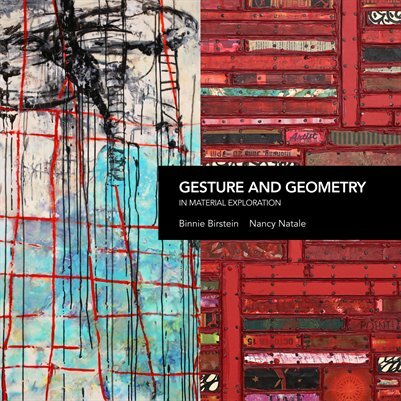 Reading it and looking at the wonderful images of her earlier work from the '60s and '70s, I was reminded of work that I had been making in the mid-'90s. I made quite a bit, but it got abandoned when I started making work on paper to sell through corporate consultants. They did not want crude-looking, black work and it didn't seem that anyone else did either. But I like it - still. I took some photos to show in the workshops. Here are a couple. I don't remember the title I gave this, so I'm just calling this Tarpaper Piece. It's torn tarpaper with black caulk, found wood and a few tacks. I was big on tacks - as you'll see. This one I do remember was called Cauldron. 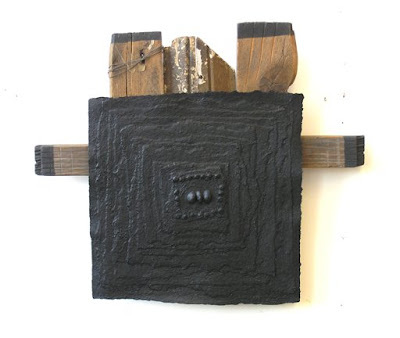 It's a found catalytic converter on wood with strips of a black foam material I was using and plenty of tacks. There's a piece of very thin netting over the converter and a lot of hidden inclusions wrapped in netting and some threads that look hairy. This one I'm calling The Twins since I don't remember the name. 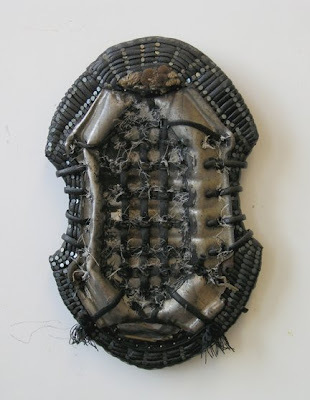 It's the black foam with tacks and some found pieces of metal with painted stripes. It has inclusions such as shells, keys, etc. These pieces are all around 15 or 20 inches or so. So I believe that this is the direction I'll be going in after the conference. I've been working somewhat sculpturally but I'm going to push it more, add some other materials to the encaustic and break out of the square/rectangle. It's an exciting prospect and I want to get started. 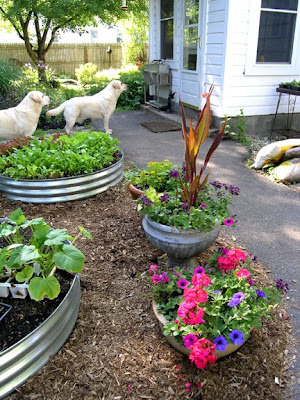 Meanwhile, what I've been doing since I haven't been in the studio is working in the garden. As I've mentioned (ranted on about) in earlier posts, the garden has been especially lovely this year because of the weather. The weather and the progression of growth has continued to be exceptional and it's been so satisfying to watch things develop. So here are just a couple (really I have hundreds) of photos, these taken just this week. 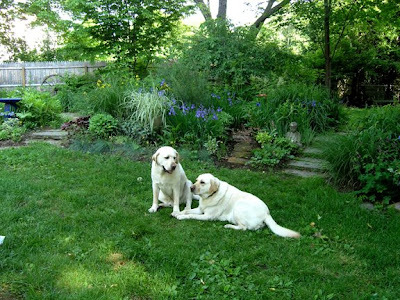 The Boys in their idyllic setting. The irises were fabulous this year - even though I dug up hundreds, there was still amazing bloom. Here are the boys waiting for the Pack Leader to emerge and take them for a ride. This is how I feel waiting for the conference to start. I'm not taking my eyes off Friday.